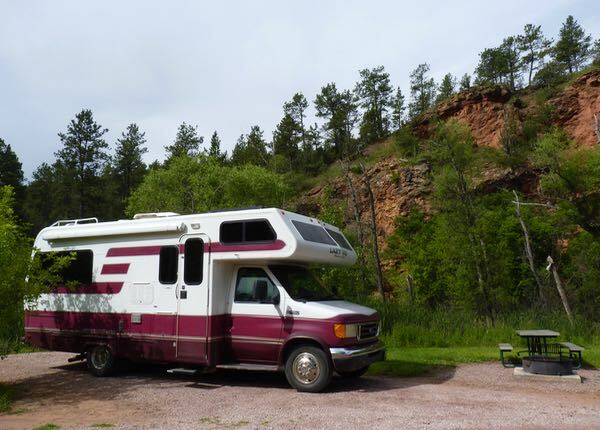 First stop in the Black Hills was at Jewel Cave National Monument to tour the cave with sparkling rocks. There was a two or three hour wait to get in; even though I arrived early. So, I took a short hike, then decided it wasn’t worth waiting that long. Checked with the ranger, and he told me that Wind Cave National Park was always more crowded than Jewel. So, I skipped that one too; as I wasn’t that into spelunking. 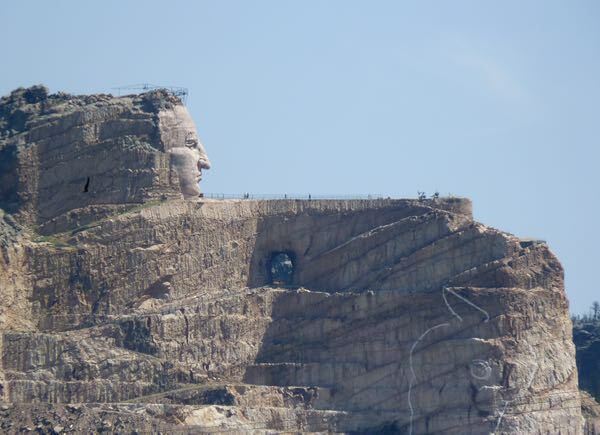 I drove by the Crazy Horse Memorial, and it appeared they have not made any progress in carving the monument. Apparently, all the entry fee money is going toward the museum and other facilities they have built. Too bad, as it would surely be impressive when completed. 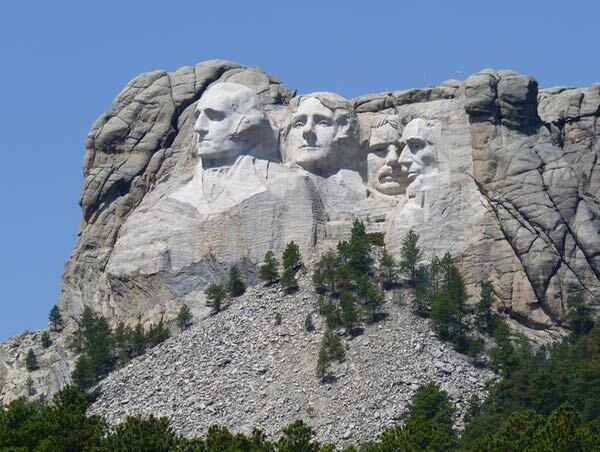 Next, I went to see the Mount Rushmore Memorial. Parking was $11, and it appeared the RV lot was almost full. So, I drove past and found a spot to photograph it from the road. That was good enough for me. 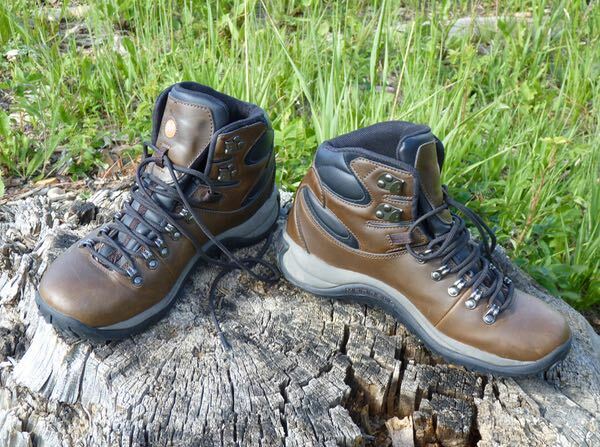 I have been wanting to buy a pair of good hiking boots for some time. Getting by with work boots and sneakers wasn’t good. So, I went to Cabela’s. I’m partial to leather and the kind that supports my ankle. Merrell seemed to fit well and give more support than the Keen brand. Ended up with leather Reflex Mid Hikers by Merrell with Gore-tex waterproofing. Hope they will be an improvement. Found an inexpensive camp for a couple of nights. My spot was next to a cliff, and there was a small lake with a picnic area, playground, and beach. Picnic table, fire-ring, pit toilets, and good internet for $4 per night with senior pass. The campsites were sized for small rigs and tents only. Considered what else I could do in the area. Everything I had passed was crowded and all the attractions charged an entry or parking fee. Way too commercial for me. There really was nothing that appealed to me worth the effort. 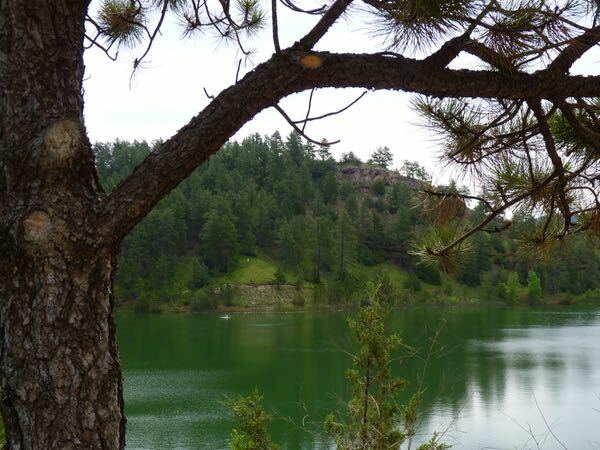 Frankly, I was not impressed with the entire Black Hills.